It seems like everyone has an opinion about which color of metal is best when it comes to replacing hardware and light fixtures in their home. Stacy recently gave her home a little makeover by changing out all the cabinet knobs/pulls, light fixtures, and faucets. What color do you think she chose? Answer: she went with mixed metals! By using a variety of metals, she was able to keep her options open! You can have fun with the mix & match feel while still keeping a tasteful vibe. We think it looks fantastic. Take a look at how she mixed different colors below! We’ve included links on where you can find some of the lights and knobs. 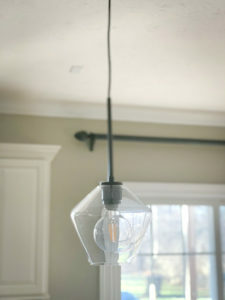 These beautiful pendant lights in her kitchen are from West Elm, and she got them on sale! 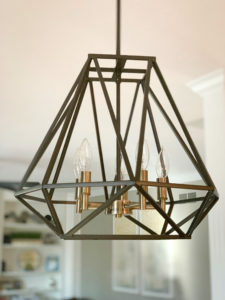 You can find this geometric pendant light from Wayfair! Look at how she mixed these pulls and knobs all over the house! Silver, bronze, and rough crystal! Stacy found all of these at Menards. 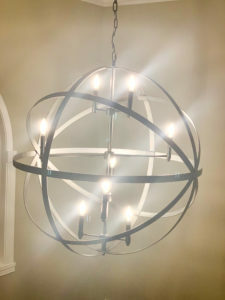 This stunning fixture is hanging in her entryway, and it’s from Amazon! We think the key to a good home makeover is to have fun! Mix things up, and don’t be afraid to try new things!